After deciding against allying with TDP, Congress is considering going it alone in West Bengal. Party summons state leaders to Delhi to discuss issue Friday. New Delhi: Rebuffed by the Samajwadi Party (SP) and the Bahujan Samaj Party (BSP) in Uttar Pradesh, the Congress is re-calibrating its alliance strategy for the Lok Sabha elections. Having decided against allying with the Telugu Desam Party (TDP) in Andhra Pradesh, the Congress has convened a meeting of West Bengal leaders in New Delhi Friday to discuss the option of contesting on its own in the state. 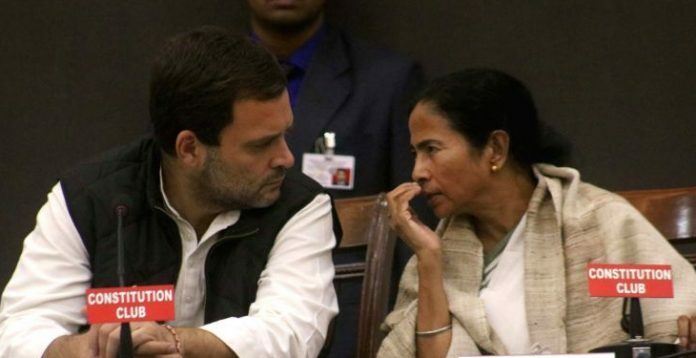 The Congress has already ruled out a tie-up with the Trinamool Congress but whether the party should ally with the Left or go it alone has to be decided by Congress president Rahul Gandhi, a senior party functionary involved in West Bengal affairs told ThePrint. Congress leaders are of the view that West Bengal Chief Minister Mamata Banerjee doesn’t want Gandhi to become the Prime Minister. She along with Mayawati and some other prime ministerial hopefuls would prefer a weakened Congress, they said. The Left parties are learnt to be keen on an alliance with the Congress in West Bengal but the party’s state unit is split on this issue. State Congress president Somendra Nath Mitra, say party sources, has conveyed to the high command that the party should go it alone in the Lok Sabha elections. Another section of leaders is, however, of the view that a four-cornered contest could benefit the BJP that is emerging as the principal challenger to the ruling Trinamool Congress in the state. Although a self-proclaimed janeudhari Shiv-bhakt, Gandhi is known to be closer to the Left ideologically and enjoys a great rapport with CPM general secretary Sitaram Yechury. But the Congress president, party leaders say, is also aware of the political dynamics in Kerala where the party is in a direct fight with the Left. A section of Congress leaders also believes that the ruling Left is “not unhappy” with the rise of the BJP in the state as it could wean away the Congress’ vote-bank among sections of upper caste Hindus, weaken its influence among Christians and Muslims and drive them towards the ruling coalition. “Our dilemma has been whether our priority should be to defeat the BJP or to strengthen the party,” said an AICC functionary, adding that the regional parties’ “apparent attempt” to undermine the Congress while talking about anti-BJPism “removed some of our confusion”. The Congress has, therefore, decided, to go with what it considers reliable allies in states such as Tamil Nadu, Maharashtra, Bihar and Karnataka, but would seek to assert its credentials as the BJP’s sole challenger nationally by contesting alone in most other states. That’s the only way the Congress can start the process of revival as it has been gradually ceding its space to regional parties through alliances, say party leaders.